Beer-braised duck legs make a moist, meaty addition to this heaping tray of nachos featured in Beer Bites: Tasty Recipes and Perfect Pairings for Brew Lovers by Christian DeBenedetti and Andrea Slonecker. To make the duck carnitas: Heat a small, heavy, dry skillet over medium-high heat. Add the chile and toast, turning occasionally, until puffy and deep brownish-red but not black, 2-3 minutes. Stem and halve the chile, discard the seeds, and chop finely. Set aside. Nestle the duck legs in a heavy pot just large enough to fit them snugly in a single, slightly overlapping layer. Add the toasted chile, orange peel, garlic, and salt. Pour in the lager, then add enough water to barely cover (it’s okay if a few points protrude). Bring to a boil over medium-high heat, then turn the heat to medium-low and partially cover the pot. Simmer gently until the meat is tender enough to shred with a fork, about 1½ hours. Transfer the duck legs to a cutting board using tongs. Meanwhile, shred the meat into bite-size chunks and finely chop the skin. Discard any excess fat and the bones. Preheat the oven to 350 degrees F. Spread about half of the tortilla chips in an even layer on a large rimmed baking sheet. Top with about half each of the duck, the beans, and the cheese. Repeat to create a second layer. Scatter the jalapeños on top. 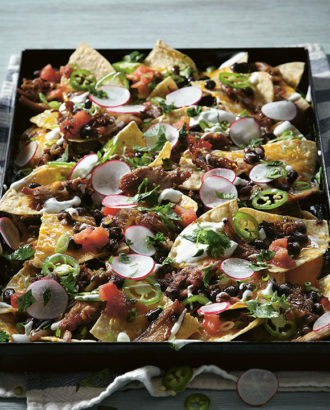 Bake the nachos until the cheese is melted and just beginning to brown in spots, 15-20 minutes. Remove from the oven and top with the green onions, then the cilantro, and then the radishes. Serve immediately with the salsa, crema, and lime wedges on the side.